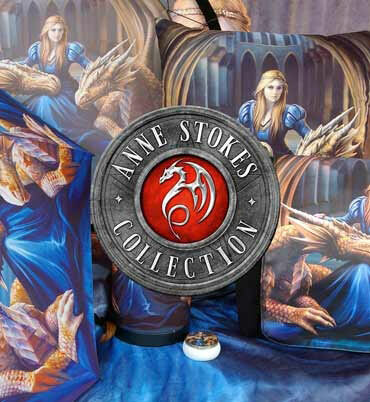 Exclusive to Nemesis Now, this enchanting shoulder bag comes from the wild and untamed imagination of Fantasy and Gothic artist Anne Stokes. In a magical forest on a moonlit night, a Fairy walks forwards towards you through a ring of mushrooms. Smaller Fairies flit about her as she locks gazes with you, her blue hair flowing down over her shoulders, iridescent rainbow wings unfurled behind her. In front of her she holds a blue Goblet, one hand over it as if she's still casting an incantation. This shoulder bag has a smaller front pocket in addition to the main pocket for greater ease and flexibility of storage, as well as an adjustable strap, making it perfect for any who want to take some magic and mystery with them on the go.